A substantially revised and updated new edition of the leading text on business and government, with new material reflecting recent theoretical and methodological advances; includes further coverage of the Microsoft antitrust case, the deregulation of telecommunications and electric power, and new environmental regulations. This new edition of the leading text on business and government focuses on the insights economic reasoning can provide in analyzing regulatory and antitrust issues. Departing from the traditional emphasis on institutions, Economics of Regulation and Antitrust asks how economic theory and empirical analyses can illuminate the character of market operation and the role for government action and brings new developments in theory and empirical methodology to bear on these questions. The fourth edition has been substantially revised and updated throughout, with new material added and extended discussion of many topics. Part I, on antitrust, has been given a major revision to reflect advances in economic theory and recent antitrust cases, including the case against Microsoft and the Supreme Court's Kodak decision. Part II, on economic regulation, updates its treatment of the restructuring and deregulation of the telecommunications and electric power industries, and includes an analysis of what went wrong in the California energy market in 2000 and 2001. Part III, on social regulation, now includes increased discussion of risk-risk analysis and extensive changes to its discussion of environmental regulation. 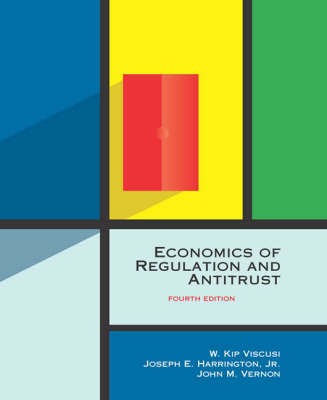 The many case studies included provide students not only pertinent insights for today but also the economic tools to analyze the implications of regulations and antitrust policies in the future.The book is suitable for use in a wide range of courses in business, law, and public policy, for undergraduates as well at the graduate level. The structure of the book allows instructors to combine the chapters in various ways according to their needs. Presentation of more advanced material is self-contained. Each chapter concludes with questions and problems.